SEXTANT was the fifth major wartime diplomatic conference between Roosevelt and Churchill, following the QUADRANT conference of 17-24 August 1943. It was held in Cairo in two sessions, on 23-26 November 1943 and 4-6 November 1943. It was the first major diplomatic conference to include Chiang Kai-shek (during the first session) and to focus largely on issues of the Far East. 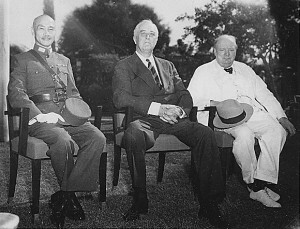 Between sessions the two Western leaders attended the Teheran conference (EUREKA) with Stalin, who declined to attend SEXTANT on the grounds that meeting with Chiang would compromise Russian neutrality in the Far East. The British came to the conference desiring to extend operations in the Mediterranean rather than be held to the schedule of May 1944 for the Normandy invasion. However, the Americans refused to discuss OVERLORD until the meeting with Stalin. This worked in their favor, as Stalin strongly opposed Western operations in the Balkans and even more strongly wanted a Second Front. The British and Americans also clashed over Chiang, the British considering Chiang of marginal importance while the Americans believed China would become a postwar Great Power. The Americans also continued to press for operations in Burma and an invasion of the Andaman Islands (BUCCANEER). Brooke wished to use the landing craft in the Aegean instead. This produced what one observer described as "the father and mother of a row" (Roberts 2009). Stilwell wrote in his diary that "Brooke got nasty and King got good and sore. King almost climbed over the table at Brooke. G-d he was mad. I wish he had socked him." Subtle differences between the King's English and American English were also sources of friction. To the Americans, to "table" a proposal meant to defer its discussion, while to the British it meant to discuss it immediately. This nearly produced a row between Portal and Arnold when Portal asked to "table" a discussion of intensifying the strategic bombing campaign. Likewise, the Americans understood British "demands" to be ultimatums when the British simply meant to enumerate what a propose course of action would demand if adopted. The several military missions have agreed upon future military operations against Japan. The Three Great Allies expressed their resolve to bring unrelenting pressure against their brutal enemies by sea, land, and air. This pressure is already rising. The Three Great Allies are fighting this war to restrain and punish the aggression of Japan. They covet no gain for themselves and have no thought of territorial expansion. It is their purpose that Japan shall be stripped of all the islands in the Pacific which she has seized or occupied since the beginning of the first World War in 1914, and that all the territories Japan has stolen from the Chinese, such as Manchuria, Formosa, and The Pescadores, shall be restored to the Republic of China. Japan will also be expelled from all other territories which she has taken by violence and greed. The aforesaid three great powers, mindful of the enslavement of the people of Korea, are determined that in due course Korea shall become free and independent. Roosevelt came away from the conference strongly disillusioned with Chiang, and Larrabee (1987) has argued that SEXTANT marked the unspoken decision to write off China. The Americans looked instead to Russian intervention in Manchuria and to their own Pacific counteroffensive to achieve the final defeat of Japan. The second session of SEXTANT postponed the Allied invasion of Burma for lack of landing craft. It also marked the appointment of Eisenhower as commander of the Normandy invasion, a great disappointment to Marshall, who hoped to command the invasion himself.